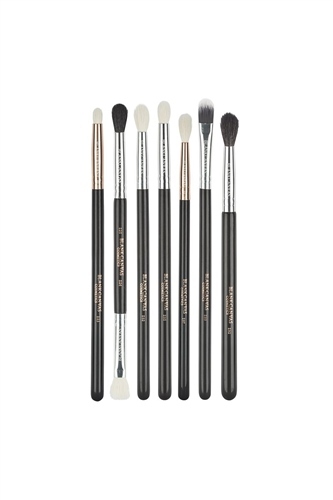 This set contains 7 essential eye brushes to create a smokey eye. Achieve the timeless classic smokey eye look using the brushes in One Stop Smokey Eye. The E23's pointed fibres are perfect for smudging shadow along the upper and lower lash lines to create definition in your eye look. This brush can be used with cream or powder products. Handmade from extra soft, high quality, easy to clean natural pony hair fibres. This is a double-ended brush that is essential to any makeup kit. The E25's side has been created with precise application and seamless blending of shadows and concealers in mind and can be used with creams or powders. The E26 is perfect for applying and blending shadows along the lid and outer corners of the eye and can be used with creams or powders. The E82's large fluffy oval fibres make it the perfect tool for applying a flawless base colour to the eyes and for overall blending. Best used with powder products. Handmade from extra soft, high quality, easy to clean natural goat hair fibres. Use this brush to apply your favourite eyeshadows and blend out seamlessly. This brush can be used with powder products. Use the E87 for precise colour application along the crease and seamless blending. Best used with powder products. Handmade from extra soft, high quality, easy to clean natural goat hair fibres. The E92's multi purpose design make this a must have brush for any make up lover. Use this brush to apply and blend your favourite eyeshadows seamlessly. This brush can be used with powder products.